A sleeping mat is a crucial, lightweight piece of kit. 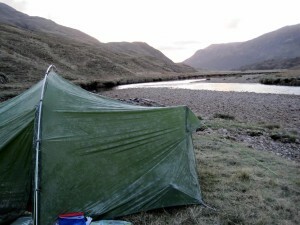 During our recent TGO-Challenge, backpacking across Scotland in May 2016, my sleeping mat, an inflatable mattress punctured during the nights when there was the hard frost. (See picture) The inside was even worse of course. To keep warm I had to wear every clothing layer I had except my waterproof. Fortunately I was using it in conjunction with a short 4mm closed cell foam mat so I avoided a seriously bad night, it was merely awful! After I recovered in the warmer weather following, old memories were revived. I invented the first closed cell foam sleeping mat, the Karrimat in 1968. It was white at the beginning and only later gained its famous yellow colour. I had to be rather bold and order 5 tons of foam to get this colour. 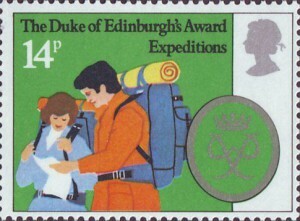 It was even depicted on a UK postage stamp celebrating the Duke of Edinburgh award in 1981. The word Karrimat became almost a synonym for sleeping mat. I was surprised only three years ago to hear a French guide using the word in a generic sense. I recall cutting and welding all the early versions myself, down in the basement in Haslingden where the smell wouldn’t be too bad, but it leaked upstairs through the lift shaft! Within five years we had reports from Danish explorers in Greenland saying these were superb, replacing reindeer skins as sleeping mats, but at -30° C they needed two! It wasn’t until 25 years later that I had the experience myself of sleeping on reindeer skins on a dogsledding trip to Spitsbergen. 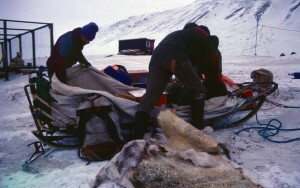 The skins were used to top off the sled load and then for sleeping on and end of day when we reached camp. Wow, of everything that’s available today my first choice for a sleeping mat would be a reindeer skin, as long as I had a dogsled team to carry it! We were already using this rather special closed cell foam for shoulder harness, as it was a rather good replacement for felt and leather. And the only choice at that time for a sleeping mat was an inflatable mattress, using rubber coated cotton, weighing around 2 pounds and having a thickness of around 3 inches ( 75 mm). When doing the research with Mary on ‘Invisible on Everest’ I was astonished to find that the first inflatable beds were created in 1824 just a year after Macintosh’s first rubber coating patent. These were used by John Franklin in his search for the Northwest passage, but we found no reports of how they fared. The 1960’s sleeping mats suffered from two problems: punctures, and the amount of air in them ensured that they were rather cold. Air is the most important insulating element in all our garment layers but it’s important that there is only a small amount of it and a 75 mm/3 inch thick mattress has a lot of it. UK mountaineering and winter activities were expanding very rapidly in this period and the Karrimat was ideal as a sleeping mat, for using in places which would have caused a mattress to spring a leak; rocky ledges, grit covered ground. It still is the best option for these situations as this rather good sleeping mat blog says. It describes just about every type of mat, but omits what I think is an important factor, the combined use of different types of mat, in other words the sleeping version of layering. What a lovely history of the Karrimat! I still have bits of the first white one that I bought at Glenmore Lodge in 1972 whils on my MLT Summer (in in late October) training. They are always down the back of a sac in case I need to sit out or bivi.Numerous others have comforted my kids and I over the years. Thank you so much for this. Yes I too saw the John Rae story in Kirkwall last year, he really is fascinating. The reference to Franklin came from an article on the history Macintosh D.W.F Hardie, The Macintoshes and the origins of the Chemical Industry’, Chemical and Industry, June 1952, 606-13. The article also refers to use of rubberised fabric by Parry on his NW passage attempts, also in the 1820s.Rae was indeed a fascinating guy with a real understanding of both polar travel and clothing and more important the Inuits, and he may well also have used Macintosh, though have found no reference.We cover the history of the building of knowledge of polar travel, starting with indigenous people in our book Invisible on Everest: innovation and the gear makers (2003). Thanks again so much for your enthusiasm for our Karrimat story. Great to hear the story from the horse’s mouth. I dropped into Tiso’s shop in Rodney St one day around ’68. You’d sent him up some white prototypes for a trial on Everest, and I managed to snag one that was surplus to requirements. It was irregularly shaped and a bit pock-marked, but worked so much better than the air mats we were using at the time!